Rare deal! Get 50% OFF Shutterfly Photo Books with promo code: PUMPKIN. This one is really too good to pass up! Offer ends 11/03/2013 so hurry over there and pick a book to customize already! *Offer is good for 50% off 11x14, 12x12, 10x10, 8x11 and 8x8 photo books and additional pages. Offer does not apply to soft covers, Premium photo books, layflat pages and Storytelling™ styles and elements. This one is not to be missed. 40% Off Everything at Shutterfly PLUS (I'm not kidding) Free shipping on orders over $30. BOTH Deals expire next Monday, October 28, 2013. Offer expires October 28, 2013 (11:59 P.M. PT). Offer is good for 40% off qualifying merchandise orders at shutterfly.com. Taxes, shipping and handling will apply. Not valid on prepaid plans, gift certificates, videograms, cards sent using mailing services, prior purchases, orders placed for in-store pick up, purchases made on the Shutterfly iPhone, iPad, Android and Photo Story apps or Shutterfly Pro Galleries. Cannot be redeemed for cash or combined with other offers or credits. Not valid for resale. 50% Off All Trim Options on your holiday cards! When: 9:00am - 11:59pm Pacific Time TODAY (10-25-2013)! When: 9:00am - 11:59pm Pacific Time TODAY! Get started with these unexpected and chic holiday circle cards! Click here to see all designs. Hurry, the deal is only good for today 10-23-2013. 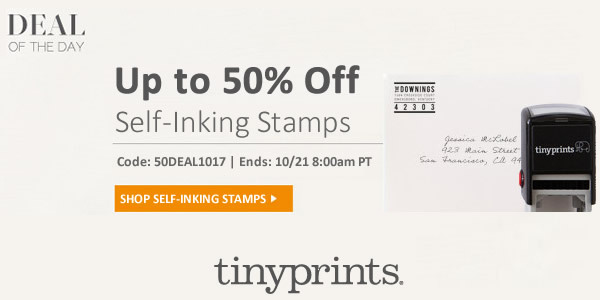 From now till 10/21/13, save up to 50% off self inking return address stamps. Use promo code 50DEAL1017 during checkout. Get it for yourself and save time for those upcoming holiday mailings, or get it as a personal gift for someone special. Customer's favorite fall favors are on sale and prices are falling this week at American Bridal! Choose from festive wine stoppers and coasters to personalized candy and mason jars. View even more products in the sale section and save today on all your gifts at American Bridal. Autumn leaves signal the time for cozy sweaters, romance, and glasses of wine by a crackling fire, which is why we love these autumn leaf wine bottle stopper wedding favors. Whether your guests are wine connoisseurs or novices, they'll definitely enjoy the luxury of this beautifully-crafted wine bottle stopper wedding favor. The perfect additions to your fall-themed wedding, these autumn leaf wine bottle stoppers are an enduring token of your thanks! Each openwork leaf-shaped bottle stopper is crafted from chrome with a copper finish and features a rubber gasket for an airtight seal. The showcase gift box features chocolate brown laser-cut leaves, a brown organza bow, and a leaf-shaped "For You" tag. This week take 10% off no minimum with coupon code 10OFF. Plus shop hundreds of our festive fall favors on SALE. *Coupons and sale prices valid Tuesday, October 15th through Monday, October 21st 2013. Decorate your tree this year with a beautifully hand-made brushed metal ornament from TinyPrints.com. Customized it with a beloved photo. They are available in round or square, each comes with a year charm and a ribbon for easy hanging. I know it's only October, but why wait till December when you can get first dibs on these darling ornaments at 25% Off? 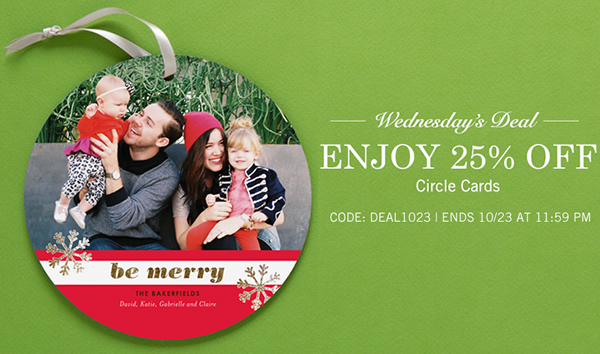 From now through 10/11/13, personalized photo Christmas ornaments are 25% off with code DEAL1010 during checkout. Introducing new gifts this week American Bridal! Choose from fun barware gifts and tools to animated cufflinks and tote bags. View even more products in our sale section and save today on all your gifts at American Bridal. For instance, give your guys a growler. Does anything say thanks quite like a manly, monstrous beer container? Nope, we didn't think so. Checking in at over 10 inches tall and nearly a half-foot wide, this Craft Beer Growler holds 64 ounces of his favorite beer (or soda, water and other preferred beverage). Made of clear glass with a screw on metal cap, this majestic & masculine container can be given at the bachelor party or rehearsal dinner for pre-wedding fun. Or, give it away at the reception for the perfect send-off. This classic growler is dishwasher safe -- we know your buddies would never hand-wash dishes anyway. The profile includes a looped finger handle for precise pouring and easy handling. Plus, you can personalize this bold, brawny beverage bin with a single block initial (his first or last name, your choice) for free. This week take 10% off no minimum with coupon code 10FF. Plus shop hundreds on festive favors on sale.